Good god, the gin industry – especially on terra australis is exploding with new distillers popping up like mushrooms. Given the myriad of flavours and infused variants, it was only a matter of time until somebody actually started working with them. Hailing form the shire of the Mornington Peninsula, Bass & Flinders Distillery has refined a Truffle Gin, which aligns perfectly with their mission statement of producing premium emissions while honouring and accentuating local produce. The earthiness the Australian Black Perigord Truffles sourced from the depths of the volcanic soil underneath Red Hill farms rest on a foundation of juniper and are flanked by nuances of angelica root and calamus root. 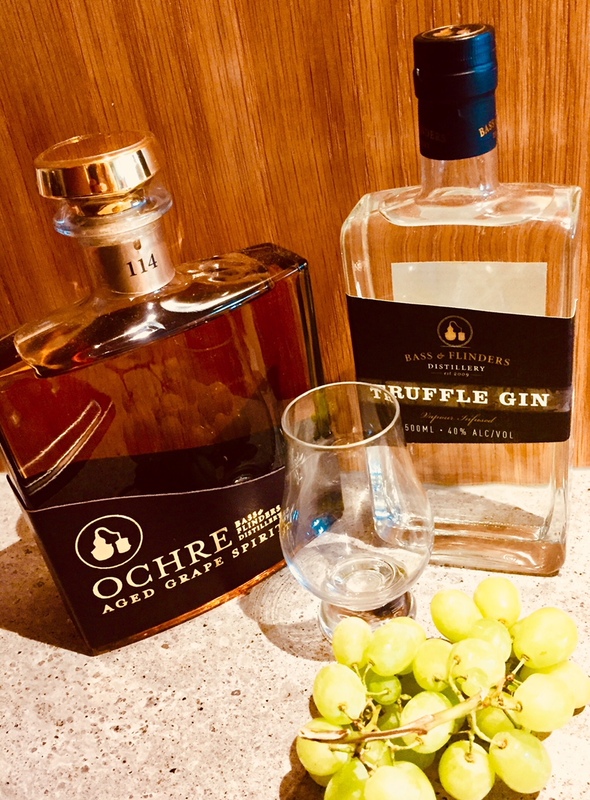 The fact that the gin is made with Bass & Flinders’ own grape based spirit, which is produced in-house by distillation of Victorian wine, which adds a velvety, creamy texture to this drop. Being a whiskey aficionado, I very much welcome the fact that the Truffle Gin is best served neat. This is not another novelty experiment but a delicious artisanal beauty that you would want to get your hands on before the limited edition sells out. Ochre Aged Grape Spirit – a refined brandy that upon the first sip unleash a mélange of aromas ranging from fruity nuances to oaky and vanilla notes with a lingering finish that makes one lust for another glass. The fact that the Ochre is such a delicious and refined spirit is almost a shame as the bottle it comes it is something that enhances and adorns any liquor shelf with its hand-made leather label. If you are remotely partial to enjoying Cognac and Armagnac, you have not lived until you have exposed your palate to this “Aged Grape Spirit” (Bass & Flinders Distillery abstains from referring to it as a “brandy”) and you would want to get your hands on it quickly as there is only limited supply. Master blending, ingredients carefully sourced from what Queensland have to offer and its drinks range and its rum expressions enjoy iconic status on terra australis. To celebrate a hundred and thirty years of channeling their rum crafting alchemy, Bundaberg Rum completes the quartet of their Small Batch release series with a Spiced expression: The result of the of the blend of aged reserves with rum mellowed in heavily charred American oak barrels, before being infused it with notes of thirteen different spices (to signify the thirteen decades of Bundaberg’s heritage), clove, hints of anise, fruit nectars, caramel citrus zest and the trademark Bundaberg “je ne sais quoi”. There is certainly no shortage of spiced rums on the market but from the first sip of this anniversary expression, one can tell that extensive research had been conducted prior to its release to ensure that the essence of what makes spiced rum work is encapsulated, i.e. dry spices, the token orangey tinge, cinnamon, vanilla and a nice dry finish. 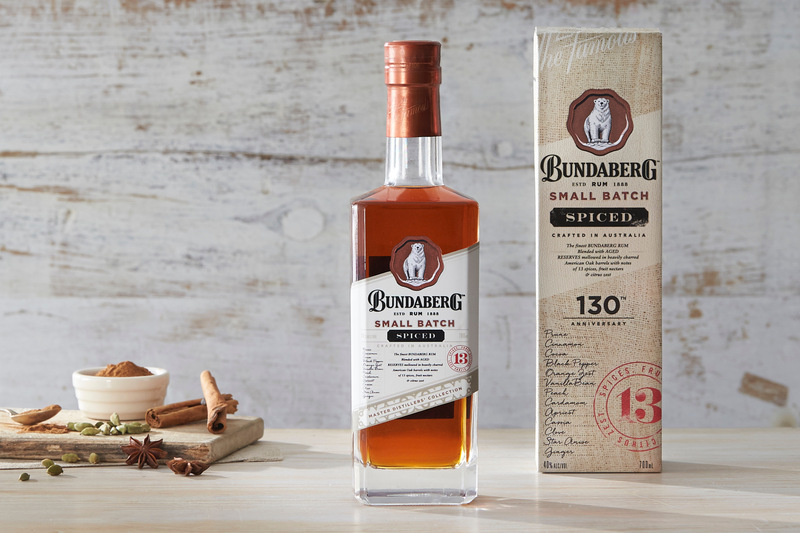 While rum is usually not my preferred tipple of choice, Bundaberg’s limited Spiced Small Batch anniversary release is an exercise in well-balanced complexity and I cannot imagine that it will last long on the shelf given the popularity of their core range.